What a difference a month can make. 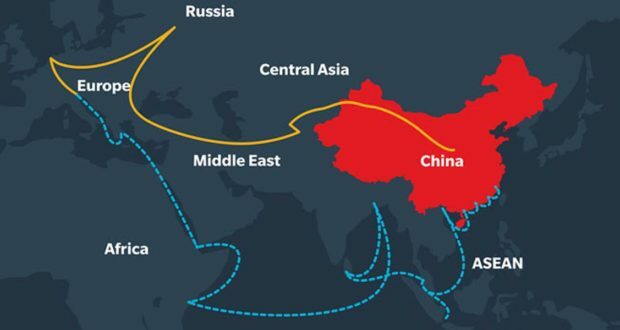 The so called Belt and Road Initiative (BRI) aims to strengthen infrastructure, trade, and investment links between China and some 65 other countries that account collectively for over 30 percent of global GDP, 62 percent of population, and 75 percent of known energy reserves. Italy became the first G7 country to sign on to China’s plan, but now the likes of Germany and France are deciding whether to dance with China and its Maoist President Xi Jinping. The economic benefits to Western Europe are obvious. China is Germany’s third largest export market, behind the U.S. and France, and second largest source of imports, behind the Netherlands, based on 2017 figures. Germany is the world’s third largest exporting nation, behind China and the U.S., and runs the world’s largest current account balance surplus. The BRI is Keynesian in its use of government expenditure to prime the pump of the private economy. However, the BRI is heavily dependent upon rebuilding the infrastructure of much of Europe to enhance trade routes. The returns on infrastructure are non-existent, in and of themselves, and will only be as effective as an expedited import-export procedure. For example, Doing Business indicators show that in Central Asia it can take up to 50 days to comply with all procedures to import goods. It takes less than 10 days in G7 countries, indicating the large scope for improvements at the border in the region. Enter the World Bank Group. As we know, the United States was a leading force in the establishment of the World Bank in 1944 and remains the largest shareholder of the World Bank today. The U.S. and only the U.S. has sole veto power in regard to changing any kind of structure of the bank. One would imagine that we may hear in the not too distant future from the Trump team on the role of the World Bank in the BRI. Like its anti-American brother, the United Nations, the World Bank could possibly provide funding for the likes of China and Russia against our national interests. In typical French fashion, one would find it hard to imagine French President Macron not buckling to the BRI as his Italian EU neighbors have. Germany is another story. The potato-faced Chancellor Merkel has a dilemma. Not only did she allow Germany to be overrun by illegal immigration, but the German government has allowed China to buy small and medium sized German businesses at an unprecedented rate. Uber tolerance will kill a nation. It would have brought Germany to its knees if the proletariat had not risen. What a surprise that Germany’s future play-partner, China, doesn’t reciprocate with the same tolerance. China continues to impose steep taxes on foreign companies in order to protect domestic firms. As you would imagine, the Chinese aren’t buying beer gardens and bratwurst stands. They are buying high tech. What is a Bitcoin and Why is it so Lucrative?